Sir Tommy is a basic game where you move cards into 4 piles, trying to build the Aces up to Kings for each suit. You try to avoid blocking yourself by placing the cards such that they will be able to move up as more cards become available. In Pretty Good Solitaire version 15.1, which will be released this week, there is a new game group consisting of Sir Tommy type games. There are a total of 57 games in this group: here are 5 of the most interesting ones. Tam O'Shanter is one of the oldest solitaire games known. It also is among the hardest. Cards are dealt out in sets of 4. You move Aces to the foundations as they become available and try to build up regardless of suit to Kings. You will probably never win Tam O'Shanter. It is simply that hard. Auld Lang Syne is an easier version of Tam O'Shanter. The difference is that the Aces are dealt for you at the start of the game. This makes it easier, but it is still a very hard game to win. Acquaintance is an easier version of Auld Lang Syne. It simply adds 2 redeals to Auld Lang Syne. This simple change makes it a much, much better game. The game is still somewhat hard, but it is often winnable. It's also much more fun to play. Acquaintance is one of the best Sir Tommy type games. Calculation is a classic variation of Sir Tommy. It plays like Sir Tommy except building on the foundations is by different sequences. On the first foundation pile, you build up Ace, Two, Three, etc as usual. But on the 2nd foundation pile, you build by Twos: Two, Four, Six, Eight, etc. On the 3rd pile, you build by Threes: Three, Six, Nine, etc. And on the final pile, you build by Fours: Four, Eight, Queen, etc. It gets complicated, but there is a guide in the status bar to help you know what card is next in the sequence. Interregnum is a 2 deck Sir Tommy type game. Each of the Eight foundation piles starts with a different rank - they are then built up regardless of suit, wrapping around as necessary. Like Calculation, it gets complicated, but it is an interesting game. 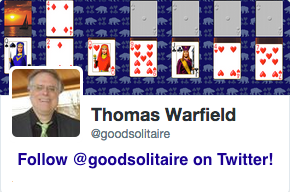 Those are 5 games to get you started with the Sir Tommy type of solitaire games. 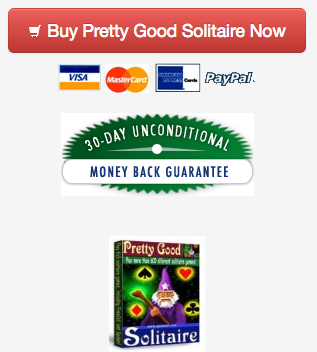 Play all 57 Sir Tommy type games in version 15.1 of Pretty Good Solitaire.